TOEIC Tests are designed for high-stakes decisions, but are also used very effectively in school settings, administered by the school itself. 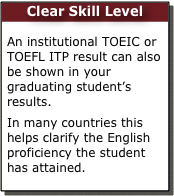 These and the TOEFL Institutional Tests should not be used in isolation, but as one of several types of in-house assessments. Adding an external test simplifies your creation of part of your assessment, and offers an objective, validated test that can also be used for teacher and school self-assessment and quality comparison through international standards. Using an external test has advantages and disadvantages, as does each of the different types of assessments. 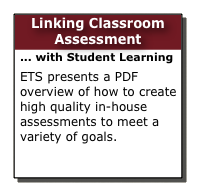 A school’s overall assessment should contain multiple assessment types, each well designed and validated, to take advantage of the strengths of each assessment type. A good understanding of student abilities can significantly improve learning. Weakness of Multiple Choice: A multiple choice test can not measure creativity, may be ‘guessed’ and can encourage teaching facts. They don’t assess how a candidate constructs their own verbal and written responses. Strength of Multiple Choice: A multiple choice test uses an objective scoring method, is efficient to administer, and samples a broad range of skills in a limited time. We encourage schools to take advantage of their teachers’ assessment skills while also using objective measurements of student capability. Use all assessments well.